Home *KnowHow Gruffalo Homefeature Illustrating Kim Nye KnowHow Maverick Arts Publishing Maverick Books Picture Book KnowHow picture books Prose rhyme writing PICTURE BOOK KNOWHOW To rhyme or not to rhyme? In this new series of Picture Book KnowHow, Kim Nye, editor at Maverick Arts Publishing, shares her tips on the big questions that plague us when we start thinking about picture books. This week she asks the ultimate question: to rhyme or not to rhyme? 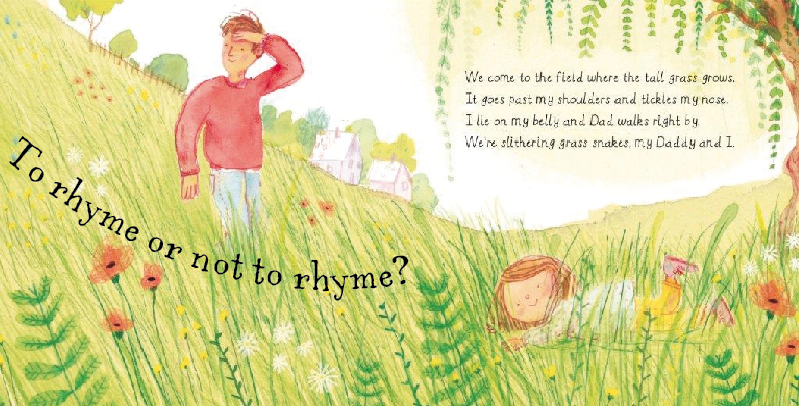 Put simply, in the UK market rhyme is extremely popular – many of our top authors write in rhyme – don't ignore the Gruffalo in the room – and let’s face it, rhyme, when done well, can turn a story from a good one into a great one. Spread from Daddy and I by Lou Treleaven - a rhyming picture book. Let's face it, not everyone can write rhyme. And that's nothing to be ashamed of, rhyme is hard! If it's not your forte, it's best to avoid as bad rhyme will mask a good story as well as make publishers cringe. An editor can help improve a rhyming text, but it's a challenging task as changing one word can end up changing the whole verse. A lot of publishers make their bread and butter by selling translation rights and co-editions to other countries. 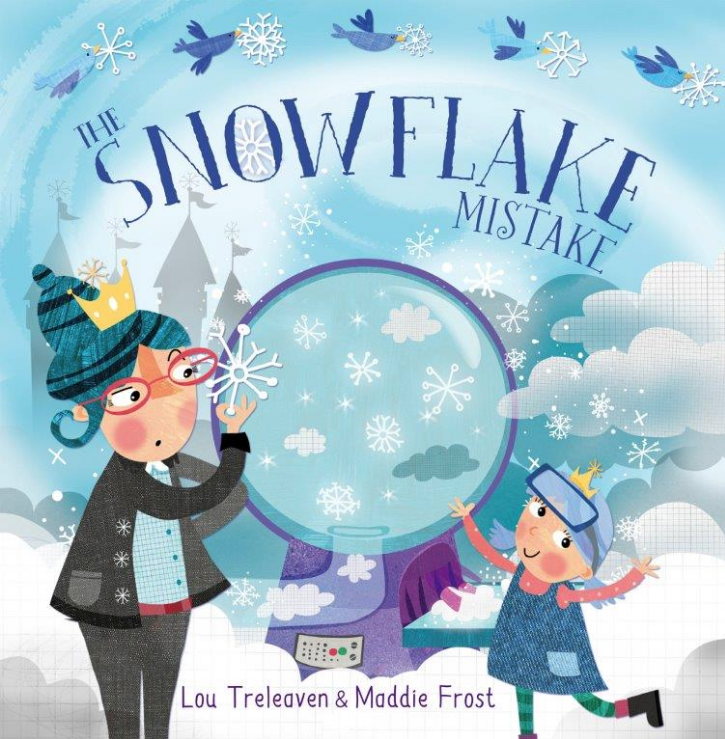 A foreign publisher may not even consider a rhyming book but if they do then they will either have to translate it into prose or translate the rhyme into their own language – which is no easy task! The Snowflake Mistake by Lou Treleaven has sold foreign rights in rhyme. So what to do? To rhyme or not to rhyme? My advice is always to write your story in both. 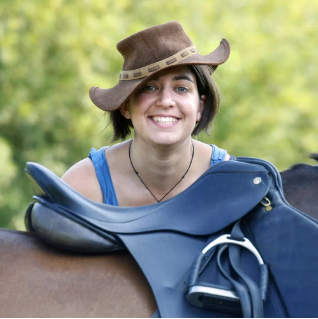 It's a great writing exercise and you might discover something you weren't expecting. After trying it both ways, you'll know if rhyme is for you and you'll know which version to submit. Never rearrange the natural order of a sentence to suit your rhyme! 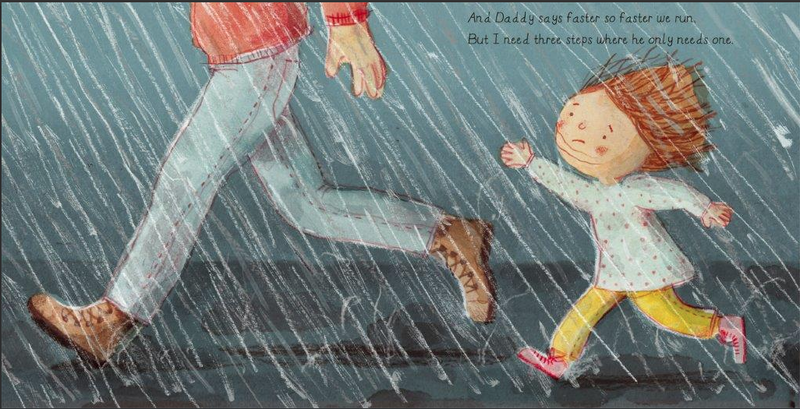 *Header image from Daddy and I by Lou Treleaven – a rhyming picture book.